Over the 4.6 billion years of its existence, the Earth has seen a large variety of climate states. During the evolution of our planet, its climate was characterized by periods of enhanced climate variability or even swings and some more or less stable - almost quiet - periods. Natural climate variability was the rule rather than an exception and the evolution of life on Earth was closely linked to climate and its change. For about 250 years, mankind has interfered stronger with the climate system via the release of radiative gases and particles in substantial amounts into the atmosphere. A global mean near surface temperature increase - global warming - can be deduced from instrumental observations, which started in about 1860. The pace and amount of this temperature increase is unprecedented at least the past 1600 years, as reconstructions from proxy data indicate. The observed warming can be attributed to a large extent to human activities as the most recent report of Intergovernmental Panel on Climate Change states. The atmospheric temperature increase is accompanied by an increase in sea surface temperature and a rise of the sea level. Evidence is building that human-induced climate change has also a direct influence on changes in precipitation and the hydrological cycle. Climate projection driven by socio-economic scenarios indicate that the global temperature and sea level rise will continue throughout the twenty-first century and beyond, the amount of which is strongly dependent on the underlying emission assumptions. There are a few climate elements that may be sensitive to sudden, abrupt changes, when a set of conditioning parameters is overstepped or certain thresholds are passed; a prominent example is a possible collapse of the thermohaline circulation in the North Atlantic. Here, further research in necessary to quantify thres­holds, effects and time horizons. Overall it can be said that a certain amount of future climate change is unavoidable regardless which route of emission reductions mankind will follow and that emissions from the twenty-first century will noticeably affect climate over the entire millennium. 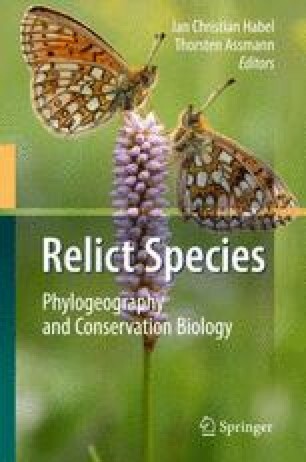 The author thanks Dr. Jan Habel and Professor Thorsten Assmann for having given the opportunity to contribute to the symposium on relict species in Luxembourg. Prof. Raymond Pierrehumbert, University of Chicago, USA, Prof. Leo Donner, Princeton University, USA, and Dr. Victor Brovkin, MPI for Meteorology, Hamburg, Germany, provided yet unpublished material, thank you all for the kindness. Valuable comments on the manuscript provided by Dr. Desmond Murphy are gratefully acknowledged. A part of the work is based on lectures on environmental meteorology and climate physics by the author at the University of Lüneburg, Germany.